My favorite Mummy was probably Boris Karloff. I think he made a much better Mummy than he did a Frankenstein Monster. Though I will probably remember him best for being the voice of "How the Grinch Stole Christmas" before Jim Carey mucked around with it and made it into a movie. 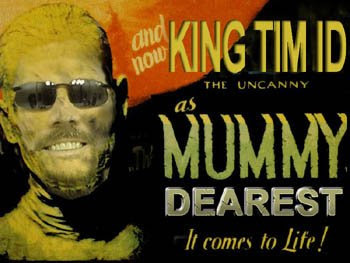 To the best of my knowledge, Jim Carey has never played a mummy (though I believe he did play a vampire). For some reason, the living are fascinated by mummies. I think it is that immortality thing. The Egyptians believed that by preserving the body, a person would live forever (I think Joan Rivers believes this, too). After a rich person died in Egypt they were often mummified, a 70-day process that involved removing all of the organs and putting them in jars. The exception was the brain. Apparently the Egyptians didn't think much of it since the mummymakers simply used a hook to pull the brain out of the head through the nose and then tossed it. 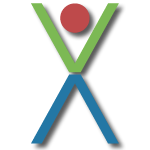 If you are really curious about the whole process, there is a Web site called You Wouldn't Want to be an Egyptian Mummy that describes it in greater detail. As far as I can tell, the whole mummy thing doesn't achieve immortality, at least not in the way the mummy would have imaged. Most mummies end up in museums or carnivals. The only mummy I have actually seen is Sylvester the Mummy at Ye Olde Curiosity Shoppe on Seattle's waterfront. Sylvester isn't even Egyptian nor did he plan to be a mummy. He died on the desert somewhere and dried out. Next thing he knew he was in a class case surrounded by tourists staring at him in his boxer shorts. Some immortality. I think the people who get their heads frozen after they die in hopes of having it reattached when technology is advanced enough (the same time when they'll create an iPod with a battery that doesn't eventually crap out) are kind of today's mummies. It's called Cryonics (Hooked on Cryonics would be kind of a cool company name if anyone out there is interested). I think I heard that Walt Disney's head was frozen. If they ever do thaw him out, they could introduce him as the new head of Disney, literally (I've been wanting to use that joke for years). The sad thing about mummies in general is that we dig them up in the name of science and then prop them up around in museums like they were somebody's Beany Baby collection. It doesn't seem right to me. Does the statute of limitations on respecting the dead run out if you've been buried for 3000 years? Anyway, as fun as having my head frozen or being a mummy sounds, I think I'll just be cremated. I could never stand the cold and I'd just as soon I be the only one who ever shoves a hook in my nose. I could never understand how someone could think freezing the head of a person who's already dead will be any use. That's why I had my head frozen in '98. Incidentally, I don't recommend it. You think you get a bad headache from ice cream? Sheesh. lol @ Lights and lol @ Tim and his Joan Rivers comment. Oh, and thanks Tim because for the past couple days after reading your posts... i can't seem to get that Bangles song outta my head. "Walk Like An Egyptian". Wondering if it may effect my bowling tonight. ;o) Oh, and i could have done without clicking that bar under Your heading. Sheesh, i get enough of that living in a house with three males. Personally, I’ve always feared being buried alive far more than having what’s left of my fragmented mind hooked out of my skull. I have made arrangements for my remains to be donated to a local college for the med students to hack up. I do believe this should keep the doctors occupied for the next twenty years or so trying to understand what went wrong. By the way, my week thus far has sucked, blown and everything inbetween. Reading your blog and the comments left by your adoring fans seems to be excellent therapy. Lights, your Brain Freeze in '98 explains a great many things. Mickey, my self-anima-ted friend. I recall your fear of being buried alive. I do think the process of removing all of your organs and hooking out your brain would safely eliminate that option if you chose mummification. My concern about donating my body to science would be being dragged around by some medical student as a passenger in their car so they could use the carpool lanes. Hope your week improves. Egyptian week is almost over. God knows what our theme will be next week. Shandi, Very observant. I thought it would be amusing for a mummy to be buried with an iPod and then be awakened to find the battery was dead. 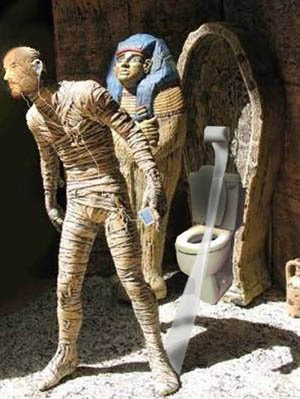 Now how about the toilet paper stuck to the unfortunate mummy's foot? I thought that was a nice touch. TIM ID ......... (i forget which themed week it changed in) ... and it made me wonder what it is that scares you Tim... is it being in the dark with a burned out light bulb?? and ok ok.. everyone else probably got that days and days ago...... but like i said at the beginning.. i have been a bit brain dead this week............ just call me "mommy" or is that "mummy"
Morningstar, as far as I know, you are the only one to notice TIM ID. I almost missed it myself. I like it because it works on several levels: timid or Tim's ID versus Tim's Ego (which I imagine many people would interpret me plastering my photo on everything as more appropriate). But to answer your question, "what scares me": I am afraid of being invisible (which seems to happen more the older I get). Blogging helps change that lightbulb that keeps me in the shadows in everyday life. I agree completely we are invading their final resting spot. Discovery or A&E had a special on how to make a mummy. Someone donated their body to science so they made a mummy it was pretty cool. Your pictures are amazing!! I feel as if I am being redundant, but I really do love the pictures! They are so wonderful! Thanks so much Cherish. You aren't being redundant and its very nice to hear that you like the photos.